Rustins was established in 1924 and has grown to a well established brand in the industry with a focus on wood finishing products, speciality paints and decorating sundries. Rustins products sell throughout the UK to home DIY enthusiasts and professionals who want quality and innovative products. After 2004, as a result of a major fire, Rustins built a new state-of-the-art warehouse adjacent to their manufacturing site. They continue research and development efforts on its core markets of wood finishing, speciality paint and decorating materials. Rusitns have focused on more durable finishes, their wide range of products has lead to the introduction of new products including Rustin’s Textured Decking Oil. Textured Deck Oil contains agents to improve the slip resistance in wet and dry conditions on exterior timber decking and timber walkways. 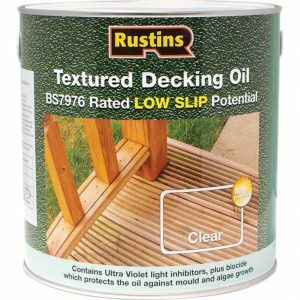 Rustins Textured Decking Oil is independently tested and rated as low slip potential according to BS7976, Part 2, 2002 assessment of slip resistance. It contains UV absorbers and biocide to protect the oil from mould and will allow the natural beauty of the wood to show through. This can be applied over the top of Rustins standard deck oil, it is not recommended on top of other brands of deck oil. Rustins have become a leading manufacturer of wood finishes and as a result have welcomed Briawax, Antiquax, Wudcare Products, Brummer and Stone’s into the Rustins group.